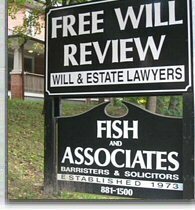 We offer a Free Will Review. Do you need a will but are not sure where to start? We offer a Free Will Consultation. Watch Les Kotzer on The Wills Network. "What You Need To Know About Wills Protecting You & Your Family"
Click on the links below to view each seminar. Now available for digital download on our website for $14.99 plus applicable taxes. 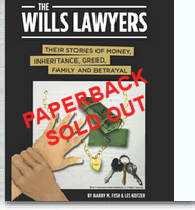 Order The Wills Lawyers book in digital format and receive a free digital copy of The Family Fight... Planning to avoid it book. The Wills Lawyers Introduction presented by Les Kotzer. Click the links below to watch Barry Fish and Les Kotzer reading stories from their new book. A Frank Discussion (a surprising homemade will story) read by Les Kotzer. Cruel Sister read by Les Kotzer. I Heard My Mother's Words (how a daughter made a heart breaking decision ) read by Les Kotzer. Taking Dad for a Ride (How low can a person go?) read by Barry Fish. The Knife in Dad's Heart read by Barry Fish. Barry Fish and Les Kotzer have co-authored three other books to help you as well. Now available for digital download on our website for $9.99 plus applicable taxes. 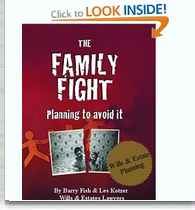 The Family Fight... Planning to avoid it is still available in paperback, while quantities last. "The book can help families prevent estate battles...Kotzer's book is written for ordinary people not attorneys." Click Here to view our book gallery. "Les Kotzer is a regular guest of The Nightside on Newstalk 1010. Not only is Les 'the' authority when it comes to wills, he is also very entertaining and compassionate, and our listeners love him. The phones never stop ringing when Les is on!" 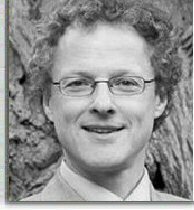 Wills Lawyer Les Kotzer has been awarded the Queen Elizabeth II Diamond Jubilee Medal. Read the article here, or watch a video of the medal presentation to Les on YouTube. Visit Les Kotzer online at www.leskotzer.com. Contact Les Kotzer by e-mailing les@leskotzer.com. Watch Les Kotzer, featured as a success story on CTV News here. Read a USA today article featuring Les Kotzer here. Wills Lawyer Les Kotzer is also a professional songwriter. Some of his songs can be heard on the radio. Listen to samples of the songs and download them here. Watch a music video of These Are Our Heroes performed by Scotty Newlands. Watch a music video of Photos In A Drawer performed by Lewis Manne. 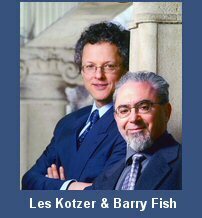 Wills Lawyers Barry Fish and Les Kotzer have prepared four audio seminars to help you. Order your set today.